Remind her she's crushing it on the remarkable journey of motherhood with this sweet, modern necklace. Remind her she's crushing it on the remarkable journey of motherhood with this sweet, modern necklace. 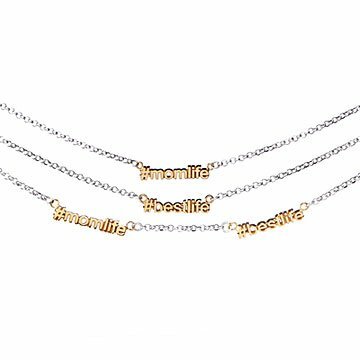 Crafted from gold-plate and sterling silver, you can choose either #momlife or #bestlife, or a double #momlife #bestlife design. The playful piece makes an inspiring gift for a friend who's just started the adventure, or for the woman who couldn't imagine anything better than being your mom. Made in Erlanger, Kentucky. Check out the #NewMom Hashtag Necklace here and the Personalized Hashtag Necklace here.